And the stuff keeps on arriving! The paperback version of Diamond of Darkness is now available at Lulu. That’s a 6 x 9 format, 452 pages, for $20. Considering that you’ll pay $14.95 to $19.95 for half that many pages of a comparable book in most stores, that’s a whole lot of pure reading enjoyment for the cranium. Having the actual physical object in my hands, I kind of got the shakes there for a while. The real deal, folks. No fooling. Although, to be honest, my friends are chewing through that page count frighteningly quick. Then come the questions about Book 2. Still working on that! But re-read the book, I’ve packed it full of repeat value contemplations and secrets. Or check out my Lulu author spotlight page and ooh-ahh. Stay tuned! At long last, after deciphering arcane instructions on the website and fiddling with settings on ancient programs I have managed an Amazon Kindle version of Diamond of Darkness. Woo and hoo, go me! You don’t need to shell out 100+ bucks for a Kindle. There are free apps so you can just get the goods and start reading. Believe it! Now time to get started on the Lulu physical version. Back to the laboratory to study forgotten mixtures and play with strange settings on the abacus we call a computer. Stay tuned, folks. 08-24-10 Update: A PDF of the complete novel has now been moved to the Gimmie Stuff page. Preface: Nervous Tremors—Dedication, TOC, and in which we eavesdrop on a conversation between strange beings. Chapter 1: A Last Revel—In which we are introduced to Rordan, his foster-brother Fikna, and their immediate social group. Chapter 2: Bungled Romance—In which two friends miss their chance for a more personal connection. Chapter 3: The Mirthy Mermaid—In which Rordan and Fikna embark on a journey by water together. Chapter 4: Nixed—In which Rordan has an encounter with the unusual. Chapter 5: Close Call—In which the travelers on the Mirthy Mermaid negotiate a water hazard. Chapter 6: An Odd Companion—In which Rordan takes a most peculiar vagrant under his wing. Chapter 7: Two Breakfasts—In which the brothers, with Borus in tow, consider their predicament. Chapter 8: Dangerous Island—In which Rordan makes discoveries both wondrous and alarming. Chapter 9: Bad Feelings—In which strains between the travelers start to show themselves. Chapter 10: Regol Coros Academy—In which a destination is reached and troubles multiply. Chapter 11: New Friends—In which Rordan meets the knowledgeable Glenys. Chapter 12: A Winning Hand—In which counsel is shared and friendships are strengthened. Chapter 13: Magic At The Grill—In which Rordan meets a strange being and an extraordinary songster. Chapter 14: The Council—In which an invitation to join a cause is extended. Chapter 15: Last Warning—In which a villain is revealed and Rordan makes a fearful decision. Chapter 16: A Brother’s Ordeal—In which Fikna sees more than he might have wished. Chapter 17: Nightmare Tree—In which a terrible foe demonstrates his strength. Chapter 18: Into The Woods—In which Glenys risks opening up to Rordan and Fikna. Chapter 19: A Poisoned Kiss—In which Rordan faces the sentinel of the fantom forest. Chapter 20: Some Secrets Come Out—In which Kea forces a decisive confrontation. Chapter 21: Fear Of Failure—In which Rordan is dealt a low blow, yet finds a new voice of friendship. After three years of semi, self-directed nonlinear exploration, the current novel is ready to be shared. I’m not abrogating any of my rights by posting this material. I’m exercising them by making a creative statement in this fashion. This is as good as I can make it given my present resources, circle of contacts, and skill level. I’ve striven to attain a level of readability that allows general standards of understanding, though I recognize and expect there will be gaps sharper and more experienced eyes will notice. I dispute the position that if you’re not a published writer, not making a living at what you’re doing, and not up to the standards of professional markets then you’re a failure and what you’re doing is a complete waste of time. Before you read, keep in mind that in my writing I have consciously chosen complexity over accessibility, introspection over immersion, and innovation/subversion over conventionality. After starting with a PDF of the preface and first chapter, I’ll post a link to a chapter every few days. After the whole thing is posted, a few days later I’ll post a PDF of the complete novel. A link to that PDF will go in the Gimmie Stuff page. This is the text for people who want a story. For those who want an object, I plan to make a physical book available by way of POD as yet to be determined. For the interested, there will likely be a limited special edition with a map, black and white illustrations, and a glossary. I’m still working on those extras. I’ll look into an ebook version too, what the hek! And if I can get my courage up I’ll make an audio file in addition, whee! All stuff, all the time. 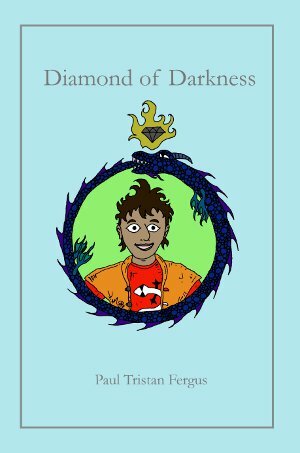 Diamond of Darkness is a young adult fantasy adventure, teenager coming-of-age story during a time of magical upheaval. You get to hang out with Rordan the protagonist and know his thoughts while he struggles with his destiny. The Diamond Island is powered by	WordPress 4.9.10 and delivered to you in 0.617 seconds using 34 queries.